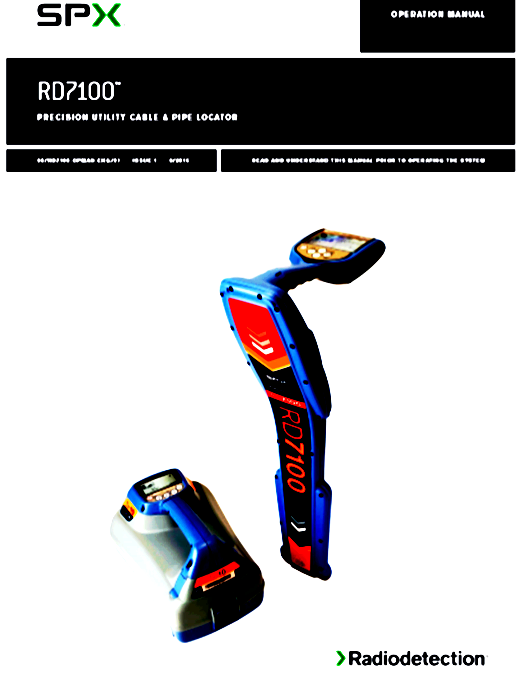 Very often many of our clients inform us that the measurements we have made in the detection of services in the subsoil are not accurate and that we must recalibrate our radio location equipment RD7000+. They are based on this in the final service report that we issue and in the depth measurements of the services detected in the subsoil (depth of cables, pipes and other elements) of the field work carried out. In most of the cases we have reviewed, it is due to a misinterpretation in the final report of our service as well as the depth measurements that we deliver to our clients. This would not have major repercussions if there was no risk. But it turns out that in some of the reviewed cases there have been incidents of rupture of services existing in the subsoil such as electrical conduits with energized cables, running water pipes, pipes of other services that end in interruption of services, additional costs and more time of what was planned in the excavations. From the conclusions drawn from the analyzes carried out, the inconvenience begins when our team measures and reports the depth of some element in the subsoil. According to the manufacturer’s recommendations, the depth measurement is made from the Centerline of the element in the subsoil to the ground level. According to the website https://www.dictionary.com The centeline is: “1.-Any line that bisects a plane figure. 2.- A line along the center of a road or highway dividing it into separate sections for traffic moving in opposite directions.” (Apr2019). In engineering and design it says that the centerline is the centerline that symmetrically “cuts” a figure or shape into two equal and symmetrical parts, that is, the centerline is at the center of any element. 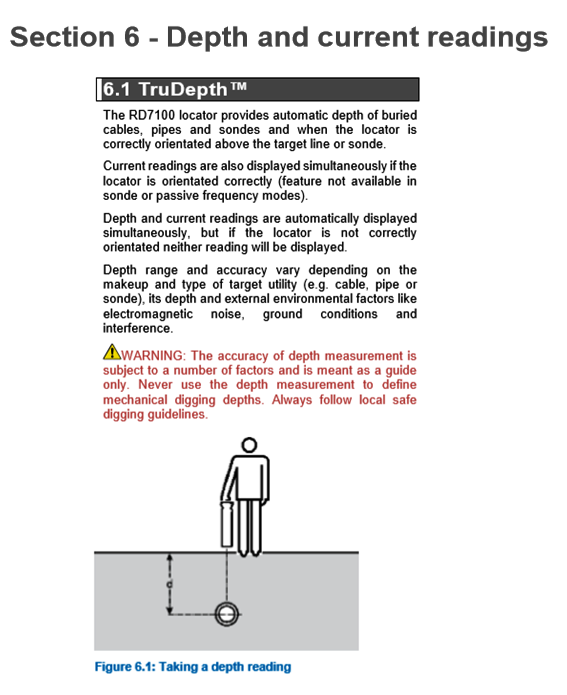 If we relate all these concepts and for example the detection of the depth of a drinking water service pipe with diameter Ø of 6″ (inch) is considered with our RD7000+ equipment, the centerline of the 6″ pipeline would be in the center of the pipe, that is, 3″ from the edge of the pipe. 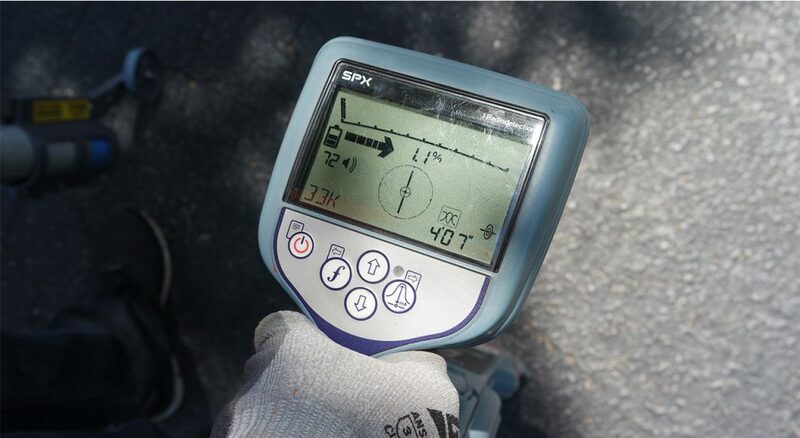 If the equipment indicates a depth of 4′ (feet) equivalent to 48″, the interpretation that must be made of the depth of this pipe, is that the upper edge is at 48″ – 3″ = 45″, which is equivalent 3′ 9″ and not 4′ as reflected on the equipment’s display . And this is where the calculation error is. We add to the warning, the following premise: the diameter of the tube is not known, to know exactly how deep the service is. Finally our recommendation: When excavating and obtaining the depth of any element in the subsoil, by service performed by us or by a third party and that is considered interference with the excavation, take extreme care with the depths, if feasible use manual excavation in the areas that present these interferences. This will minimize the risks, costs, execution times and quality of work in the projects. If you find this post interesting, let us know your impressions. We will appreciate it.